Activists at Stansted. 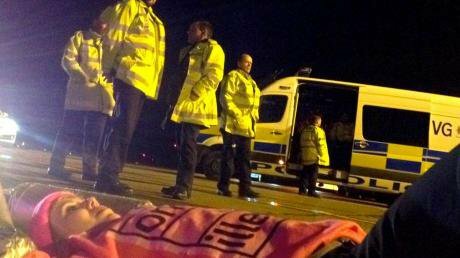 Credit: End DeportationsAt 10pm on 28 March 2017, fifteen activists wearing pink hi-viz vests entered the perimeter of London Stansted airport's InFlite executive jet centre, and walked openly across a grassed area to where a Titan Airways Boeing 767-300 was parked. The activists waved to the pilots and split into two groups; one group used metal tubing to lock themselves together at the front of the plane, whilst the remaining activists walked to the rear of the plane, where they constructed a tripod and locked themselves together underneath it. Within a few minutes, security guards arrived; by that time, the activists had already made it impossible for the plane to move in either direction, effectively cancelling the flight. The 15, from a coalition of three groups (End Deportations, Lesbians and Gays Support the Migrants, and Plane Stupid), remained on the tarmac throughout the night as the police worked to release them, with the last arrest at around 8am. The 15 go on trial at Chelmsford Crown Court next week. The trial is an important moment for social movement activism in the UK, for two reasons. 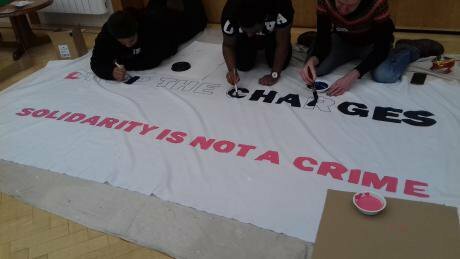 First, because it shows how ally groups have been able to use non-violent direct action to draw attention to and disrupt the British government's migrant deportation practices. These practices are, for End Deportations, particularly brutal manifestations of ‘racialised border violence’. Second, because the charges brought against the activists threaten to carry serious repercussions for the capacity of activists – from any movement or campaign – to carry out non-violent direct action in future. The activists were initially charged – as is now usual – with aggravated trespass, but face prosecution next week under a second, and much more significant charge of terrorism-related offences. We outline the importance of each point below. In July 2013, the Home Office set up the National Removals Command (NRC) unit within its Immigration Enforcement division; the unit arranges the detention and deportation of what it calls 'illegal immigrants' to their country of origin, or recognised third country; to do this, it works in conjunction with Immigration Control and Enforcement (ICE) teams who carry out arrests of undocumented migrants (at their homes, workplaces, or job centres). Once arrests are made by ICE, the NRC takes operational decisions on detention and deportation. The flights themselves are run for profit, through contracts between the Home Office and a series of private companies, including Carlson Wagonlit, Tascor, and Titan Airways. The main current destination countries are Albania, Pakistan, Kosovo, Ghana, Nigeria; flights to the Democratic Republic of Congo, Iraq, Afghanistan, and Sri Lanka have been recently suspended. In the year ending September 2016, the Home Office recorded 12,521 'enforced returns' of people resident in the UK found to have breached British immigration laws, or without leave to remain in the UK (such as failed asylum seekers and visa overstayers); of these, the vast majority (11,001) were deported from IRCs (immigration removal, or detention centres, such as Yarl's Wood, Colnbrook, and Harmondsworth). A further 5,825 foreign nationals convicted of crimes were also forcibly deported, whilst 25,306 foreign nationals were induced to leave under threat of deportation, through the Home Office's 'voluntary return' scheme. Deportation itself can be a traumatic experience: campaign groups emphasise that people about to be deported are given short notice, many are still pursuing legal claims, have had little access to legal aid lawyers from inside IRCs, and have legitimate grounds to fear for their safety on arrival in the destination country. The defendants claim that their action was able to stop 34 of the 57 deportations, as a 48-hour delay allowed these detainees additional time to pursue their cases (a second replacement flight left two days later, with only 23 people on board). The defendants claim that their action was able to stop 34 of the 57 deportations, as a 48-hour delay allowed these detainees additional time to pursue their cases. Current government policy is widely known as Deport First, Appeal Later. Introduced in 2014 by Home Secretary Theresa May for foreign offenders, it was subsequently extended to all categories of deportees, and remains operative despite being unanimously ruled an unlawful breach of Article 8 of the European Convention on Human Rights by the UK Supreme Court in June 2017. The Unity Centre notes that this policy creates 'multiple barriers to justice', including the difficulty for deportees of gaining legal representation and lodging an appeal within 28 days, often with little security or financial resources. Given the short timeframe for lodging appeals prior to deportation, Home Office policy is for 'reserves' to be placed on coaches to the airport, in case those scheduled for deportation are able to secure a reprieve; if not deported, they can be re-assigned to a different IRC. In 2013, HM Inspectorate of Prisons criticised this policy, and recommended that it cease. The Home Office has used charter flights for deportations since 2001; a Freedom of Information request in 2016 revealed that 1877 people were deported this way in 2015, and 2,364 were deported in 2014. Corporate Watch suggests that charter flights are particularly attractive to the Home Office because they have a deterrent effect on people held in IRCs (and indeed, even on people who may wish to come to the UK or whose immigration status is uncertain). They are also a tool of international diplomacy: consideration that a country is 'safe' to receive charters is important. For example, charter flights to Pakistan were included as part of a wide-ranging trade and aid deal between the two countries in 2011. Charter flights are especially concerning for three reasons. First, unlike commercial flights, they take place under conditions of secrecy. This means that the flights leave at night, from areas of airports that are not subject to public scrutiny, on carriers that do not have a commercial public profile. Commercial carriers are much more vulnerable to social movement campaigning. For example, in October 2017, a coordinated #FreeNneka twitterstorm by LGSM successfully forced Virgin International airlines into refusing to carry out the deportation on a scheduled flight to Lagos of a lesbian Nigerian woman, for fear of the potential damage to its brand reputation. Charter carriers such as Titan Airways are more insulated from public opinion and reputational pressures. Equally, unlike for commercial carriers, what happens on the charter flights themselves is not subject to public monitoring. Typically, each deportee is accompanied by two security guards from a private contracted firm, who are permitted to use a variety of restraining techniques, including handcuffing and waist restraints. The same techniques that caused the death of Jimmy Mubenga in 2010 remain in operation; Mubenga died after being maintained in a compressed position for over half an hour by three G4S security guards whilst being deported to Angola. Second, if charter flights make deportation and its attendant practices less visible in the UK, they make it more visible in the country to which the individual is being deported. Deportees are likely to be highly vulnerable to repression and victimisation in the receiving country, especially where they have attempted to claim asylum in the UK. Deportees on commercial flights are unremarkable in the passenger manifest; on dedicated deportation flights, individuals are clearly identified to the local authorities, increasing the risk to them of detention on arrival. If charter flights make deportation and its attendant practices less visible in the UK, they make it more visible in the country to which the individual is being deported. Third, because charter flights are specially commissioned in advance, there is good reason to believe that they shape the decision-making practices of the Home Office. For example, the charters arranged for the last three months were for Albania (four flights), Pakistan (three flights), plus one flight to Ghana and Nigeria and one flight to Bulgaria, the Czech Republic, and France. Whilst the details of the contracts with the companies that manage these flights are subject to commercial confidentiality, according to Corporate Watch there is substantial anecdotal evidence that individuals are arrested and processed to order, to ensure that the arrangements the Home Office has with private contractors are commercially viable. Rather than decisions being taken on a case by case basis, therefore, there is an incentive for ICE agents to arrest migrants of specific nationalities, and for the NRC to take decisions about their detention and deportation, just to fill the flights. As noted above, the 15 Stansted defendants were initially charged with aggravated trespass, in the same way that Plane Stupid activists who occupied the emergency runway at Heathrow airport in July 2015, and Black Lives Matter activists who occupied the runway at London City airport in September 2016, were also charged. In both these cases, the activists aimed to stop commercial flights, and make a political statement about the relationship between social inequality and climate change; in the second case, the activists specifically argued that the climate crisis is a racist crisis, contrasting the privileged users of London City airports with the populations of the global south impacted by climate change and the predominantly BAME inner city populations in the vicinity of the airport impacted by toxic air. Activists used the same established non-violent direct action techniques of tripods and lock-ons as used at Stansted. In the Heathrow case, though she subsequently failed to carry out her threat following a public outcry, the Magistrate had initially threatened to send the 13 defendants to prison. This was because the occupation had caused widespread disruption to passengers: 25 flights were cancelled and significant delays caused to other flights, so that 92,000 people were 'victims' of the action. In the London City case, the defendants were handed conditional discharges, and a small fine, again for aggravated trespass. Initially, the Stansted 15 – who used the same techniques, and occupied an arguably much less significant part of the airfield for a similar amount of same time – were charged with the same offence of aggravated trespass as at London City and Heathrow. This charge still stands. They also, however, face a much more serious charge. In the summer of 2017, the Crown Prosecution Service successfully applied to the Attorney General to introduce a new charge, that of ‘endangering an airport’. In the summer of 2017, the Crown Prosecution Service successfully applied to the Attorney General to introduce a new charge, that of ‘endangering an airport’ under s1 of the Aviation and Maritime Security Act 1990. This is the first time that activists taking non-violent direct action have been charged under this Act, or have been charged under an Act of similar severity. Its consequences cast a long shadow over the trial. never shied away from taking the measures necessary to crush the threat of terrorism - be it on the international stage or at home. This Bill will be another valuable weapon in the battle. [...]. Clause 1 deals with what are essentially terrorist acts at airports [...] making it an offence under our law to carry out armed attacks at international airports and to cause damage or disruption at such airports. For the defendants, the direct consequence of being charged under the Act is that they are facing potential sentences not of small fines and suspended prison sentences, but of life imprisonment. As such, it marks an alarming attempt by the British State to stigmatise non-violent direct action as domestic terrorism, and to foreclose on legitimate social attempts to question the Home Office's detention and deportation practices. It marks an alarming attempt by the British State to stigmatise non-violent direct action as domestic terrorism. It follows years of controversy about the extensive operations of undercover police officers in non-violent social movements. This is now the subject of an official public inquiry and in activist circles, there is much talk of the criminalization of dissent. The severity of the charge faced by the Stansted 15 should therefore be seen as a potentially important moment in defining the scope for non-violent protest in the UK. Instead of a very short trial with the verdict decided by a Magistrate, the charge also means the defendants will face a trial likely to last at least four weeks, with the outcome decided by a jury. The campaign aims to give voice to migrants as they are held within the spaces of detention and deportation. End Deportations volunteers record the personal stories of migrants in IRCs for the Detained Voices blog, and use them to develop casework; activists carried examples of these stories as they made their way to Stansted for the action. 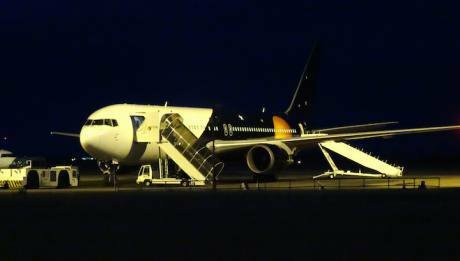 A major 'terrorist' trial creates a very public stage for the group to attempt to create public resonance, to draw attention to deportations via charter flights and to give voice to otherwise silenced migrants held in detention centres. There are of course major risks for the defendants: first, the judge may direct the jury towards a strict interpretation of the letter of the law (which does not mention terrorism) rather than towards an interpretation of the aims of the law (which specifically concerns terrorism); what is meant by a 'device', and whether it includes a tripod or metal tubing, is likely to be a key point in the trial, since s1(2) of the Act, under which the defendants are charged, states that it is an offence 'for any person by means of any device, substance or weapon unlawfully and intentionally [...] to disrupt the services of [...] an aerodrome'. Second, the judge may prevent the defence from presenting their 'political' motivations in court, and thus from explaining the reasons for their action – leaving them the possibility of explaining what they did, but not why they did it. The defendants are likely to argue first that they are not guilty under the terms of the Act, and second that their actions are justified under terms of necessity – in other words, that their actions are lawful because they acted reasonably and proportionately to prevent imminent serious harm. On recent occasions where activists have been found guilty by a jury, decisions by a judge not to accept a necessity defence have been crucial. Yet raising the stakes also gives the defendants an opportunity to win the case: the evidence suggests that juries are more likely to acquit than magistrates in all cases. Yet raising the stakes also gives the defendants an opportunity to win the case: the evidence suggests that juries are more likely to acquit than magistrates in all cases. Juries in the UK have on a number of recent occasions found in favour of activists for their participation in non-violent direct action, particularly where the activists are able to convince the jury that they acted out of sincere and reasonable belief. Further, the disproportionate nature of the charges risks not just that the jury will ‘perversely’ acquit (the possibility of ‘jury nullification’, where a not guilty verdict is returned despite the strength of the evidence, is frequently praised as an inherent benefit of jury trial), but that the judge will direct or order an acquittal. It is a reasonable question therefore to ask why these charges have been brought in this case, given that there must be a strong chance that the jury will acquit, and that it was not used in the previous, similar cases outlined above. Logically, it serves two purposes. First, it is an attempt to definitively shut down the direct challenge that the 15 defendants have posed to the Home Office's detention and deportations practices. The fact that the action was able to save 34 of the 57 people due to be placed on the flight from being deported, can be expected to be a vital part of the necessity defence to be presented in court; more importantly, it eloquently exposes the arbitrary and repressive nature of the Home Office's policies. Buying even a little time enables people scheduled to be deported to contact legal counsel, and to gain the type of effective representation that is denied to them in IRCs. Second, it is logical to assume that the bringing of this charge is an explicit attempt to silence not just collective challenge to deportation policies, but non-violent direct action in Britain as a whole. As such, the charging of the Stansted 15 is part of a wider trend of democratic enclosure central to the imposition of neo-liberal politics, and to the stigmatising and exclusionary dynamics of austerity. In the face of these actual and threatened silencings, the outcome of the trial is likely to depend on how effectively the defence can give a voice to people who are systematically denied it.